My Left Foot is story of Christy Brown, brought to life on the screen by Daniel Day-Lewis. Christy Brown was born with cerebral palsy to a Dublin couple who eventually had 22 children; Christy was one of the 13 who survived. As with all amazing movies, it leaves you with haunting messages that return unbidden throughout the day. The boisterous family life depicted in the movie is said to have been accurate. There is a short clip in the special features section of Mrs. Brown, Christy's determined mother. Thinking about Christy Brown and how incredibly resourceful and utterly undefeatable he was in his quest for normalcy makes me search deep within myself for any shred of such traits. It is a huge gift to engage thoroughly with excellent story-telling, and this movie proved to be a Monday night surprise we won't soon forget. For further reading see the wikipedia entry here and the IMDB.com entry here. The biggest surprise, though, is not only that Christy Brown wrote the book that led to the movie. He also did the illustrations. All with the only limb he could control - his left foot. 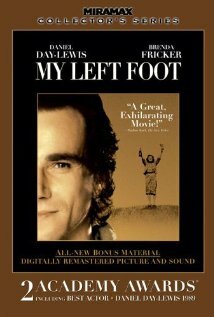 It is no wonder Daniel Day-Lewis got an Oscar for his performance, which included typing with his toes. But what brought tears to my eyes was another clip of Christy Brown himself, slipping a new page into his typewriter and typing away - no hands - just with his left foot. Did I complain when my computer was at the Apple Hospital? Shame on me! One of life's nicest surprises is to become engrossed by a movie, charmed by the characters and drawn in by the plot ... then to find out as the credits roll, this amazing tale is based on a true story! This has happened thrice recently, thanks to Netflix and our love of the BBC and British humor. With the inimitable Judi Dench, the story amused and touched me. I thought I knew something about apartheid but quickly realized the opposite watching this amazing movie. As human beings, we can hold prejudices that fly in the face of we think we believe. Watch the credits! This fun story examines what it takes to keep a business afloat in tough times, why people cross-dress, and gives a fabulous (albeit quick) clip of exactly how a shoe is put together. Fascinating, so be sure you watch the extra feature! Netflix gives us the freedom of watching movies when WE want to watch them and WITHOUT commercial interruption. Furthermore, we can see the "indie" and foreign movies we find so much more interesting than those in the mainstream. Often, the stories in the special features, which tell of the "making of the movie" speak to the creative in me. Hearing the book author, adaption and scriptwriter and others' stories of perseverance, belief in the project and passion for the subject simply light a fire in me.